Cooking with Joey: Lets Talk Turkey! OK, so, the first and most important part of Thanksgiving dinner, at least for me, has to be the turkey. It just wouldn't be Thanksgiving without it! But where do I start? There are many things to consider and many steps to preparing a turkey. It can be quite overwhelming! My brother, Bobby, once called my Mom and said "ok, Mom, how do you cook a turkey?" and her first thought was to ask him "from what point?" because, like I said, there are several steps to take. She didn't know if he was asking her to start at the very beginning or if he was asking something as simple as "how long should I cook it?". So, she said to him "How much do you know?" and his response was "This is a turkey." And to that she answered "Aha. Well alrighty then.... here we go...."
There are many ways to cook a turkey. You can roast it, grill it, or deep fry it. But regardless of how you choose to cook it, there's one thing you MUST do first, and that's to BRINE your turkey. It makes ALL the difference in the world and you'll wind up with the juiciest turkey you've ever tasted. I'm not even kidding. You won't even believe how juicy a turkey can be! To be honest, I must confess, I've never even cooked a turkey. Well, maybe once, but I'm sure I had my Mom on the phone the entire time. So, I launched into "research mode". I looked up a few web sites and then I turned to an authority on the subject, my sister, Jeanie. Every year, we have quite a huge Thanksgiving dinner, which means more than one turkey. Well, actually, we do two turkeys and a turkey breast. We all have our cooking assignments and Jeanie always cooks one of the turkeys. It always turns out perfectly and she swears by brining her turkeys. If it's good enough for my Jeanie, it's good enough to recommend to you! Below is an excerpt from an article I found at About.com. I found it to be EXTREMELY informative when it comes to brining. Do your Thanksgiving a favor and take a quick minute to read it. You'll be glad you did! Following the article, I've listed a few brine recipes. And following the brine recipes, I've listed a few links to assist you in cooking your turkey via whichever method you choose. You can TOTALLY do this! I know it seems a little daunting, but just relax and breathe. It just takes a little planning and a little organization. It'll all turn out fine! Promise! To properly brine a turkey you need to start the night before you plan to cook. You will need at least 10 to 12 hours (plan on 1 hour per pound of turkey), a container large enough to hold your turkey and enough brine to cover it. You'll also need salt, water, sugar, seasonings, and enough room to refrigerate it. A large stainless steel stock pot or even a 5 gallon clean plastic bucket would make excellent containers. Whatever container you choose the turkey needs to have enough room to be turned so it should be big. Both Reynolds (Oven Roasting Bag for Turkeys) and Ziploc (XL Storage Bag) make very large food safe sealable bags that are great for brining. Now let's get to the turkey. The turkey should be cleaned out, completely thawed, and should not be a self-basting or Kosher turkey. Self-basting and Kosher turkeys have a salty stock added that will make your brined turkey too salty. A fresh turkey works best, but a completely thawed, previously frozen turkey will work just as well. To make the brine, mix 1 cup of table salt in 1 gallon of water. You will need more than 1 gallon of water but that’s the ratio to aim for. One way of telling if you have enough salt in your brine is that a raw egg will float in it. Make sure that the salt is completely dissolved before adding the seasonings you like, making sure not to add anything that contains salt. Brines can be spicy hot with peppers and cayenne, savory with herbs and garlic, or sweet with molasses, honey and brown sugar. Sugar is optional to any brine, but works to counteract the flavor of the salt. While you may choose a brine without sugar, I do recommend that you add sugar (any kind of "sweet" will do) to maintain the flavor of the turkey. Add up to 1 cup of sugar per gallon of brine. Like the salt you need to make sure that the sugar is completely dissolved. Place the turkey in a container and pour in enough brine to completely cover the turkey with an inch or two to spare. You do not want any part of the turkey above the surface of the brine. Now you put the whole thing in the refrigerator. 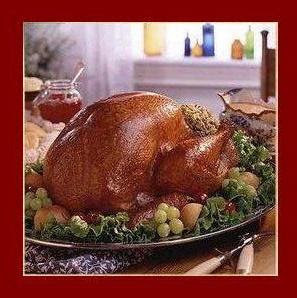 The turkey should sit in the brine for about 1 hour per pound of turkey. Brining too long is much worse than not brining enough so watch the time. Don't have room in the refrigerator? Try a cooler. A cooler big enough to hold your turkey makes a good container for your turkey and brine. The cooler will help keep it cool and allow you to brine your turkey without taking up precious refrigerator space. If the weather is cool, but not freezing you can put the whole thing outside until you need the turkey. If the weather is warm fill a half gallon milk carton with water and freeze it. Place this in the cooler with the turkey and brine and it will hold down the temperature during the brining process. When you are ready to start cooking your turkey, remove it from the brine and rinse it off thoroughly in the sink with cold water until all traces of salt are off the surface inside and out. Safely discard the brine and cook your turkey as normal. You will notice the second you start to carve your turkey that the brining has helped it retain moisture. The first bite will sell you on brining turkeys forever, and after you've tried this you will want to brine all your poultry.